This movie is half comedy, half suspense/mystery. However, half of each don't quite add up to a whole. I left the theater feeling a bit dissatisfied. Its probably because the basic story of the movie is a very somber one. There are murders. The main character finds his world turned upside down and can trust no one, always finding himself in constant danger. The jokes and that infused into the script seem quite out of place. This could easily have had no comedy at all and been purely suspense/mystery. On the other hand, however, the plot was too cookie cutter and much too unrealistic for it to have been effective on its own as a suspenseful drama. What saves the movie from totally sucking, I would say, is Orlando Jones (below - left). Orlando is probably most famous for his hilarious 7-Up commercials. He proves here that he can handle feature films; unfortunately, he doesn't have much help in this movie. His character is the protagonist of the movie and gives us someone to identify with. Daryl Chase (Jones) is a successful Wall Street executive who unfortunately uncovers a money laundering scheme and finds himself being "Chase"-d throughout the movie. Daryl eventually turns to petty thief Freddy Tiffany (Eddie Griffin - above - right) for assistance in preventing himself from being found. They wind up trading places and assuming each other's identity. This is where most of the comedy is found. And it is funny, but it has been done before many times (Trading Places, for instance, was a much better movie and was funny throughout). Furthermore, as I have mentioned before, it seemed inappropriate with the plot. For his part, Eddie Griffin is funny at times, but for the most part is flat out annoying with his over-the-top antics and speech. The villians are uninspired and undeveloped, and the rest of the cast just seems like filler. The story has several plot twists redefining the true essence of the characters along the way, yet it is quite predictable as well. In the end, all I really got out of it was a couple of laughs. 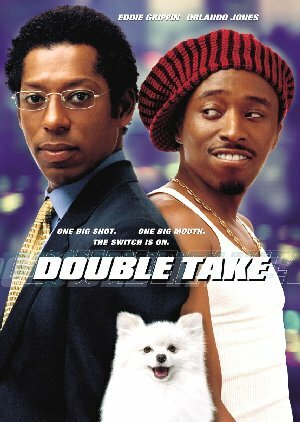 How would you rate the movie Double Take? There have been 8878 people to visit this page since Mon, Jan 15, 2001. And you are the first person to visit this page today!